Complete system to automate the supply of raw material into the process of Corn or Flour Tortillas, and Tortilla Chips. Tote or super sack frame and hoist with painted carbon steel or stainless steel finish. 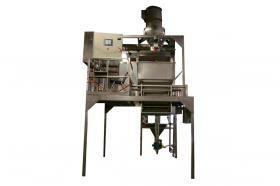 Vacuum transfer to weigher hopper and dump by gravity to mixer or steam kettle. User-friendly fully automated touch screen controls for ease of operation. 'Set and forget' system will manage the process from beginning to end. Scale Hopper & Support Frame. Stainless steel Platform, to hold Mixer with stainless handrails & stairs.